TURKONFED, TUSIAD and UNDP established a private sector-led Think-Do-Tank platform in Turkey, first of its kind in the world, to work for the United Nations’ universal call of Sustainable Development Goals. Named “Business for Goals”, the platform will be chaired by Ms. Ümit N. Boyner. Focusing on 17 Sustainable Development Goals of the United Nations ranging from poverty to climate change, from environment to gender equality, the Platform aspires to boost the contribution of businesses to sustainable development. 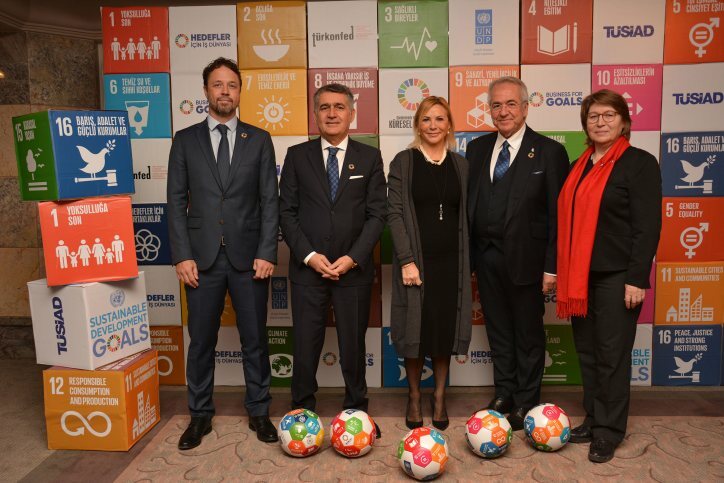 TURKONFED, TUSIAD and UNDP has taken action with the view that all actors in the society have a role for sustainable development, and established the “Business for Goals Platform”, the first-ever private sector-led Think-Do-Tank platform in the world. With Ms. Ümit N. Boyne assuming the role of Founding President of the Executive Board, the Platform will bring together private and public sectors as well as NGOs on the shared value of “sustainable development” and offer roadmaps to the private sector how to act as a solution partner in development. The Platform will, for the next two years, engage in analyses on sectors to be designated. The aim is to start multi-stakeholder dialogues based on these analyses to formulate policy and strategy recommendations for private and public sectors and NGOs, guide in the implementation, and contribute to implementing solid programmes on the ground. Focusing on 17 Sustainable Development Goals ranging from poverty to climate change, from crisis management to gender equality, the Platform aspires to boost the contribution of Turkish businesses to sustainable development while securing their long-term success. The memorandum of understanding for the Platform established by a joint initiative of TURKONFED, TUSIAD and UNDP was signed in the meeting at Grand Hyatt Istanbul Hotel. Present at the meeting were Ms. Ümit N. Boyner, Founding President of the Executive Board of Business for Goals Platform; Mr. Erol Bilecik, President of TUSIAD; Mr. Orhan Turan, President of TURKONFED; Mr. Claudio Tomasi, UNDP Resident Representative ai. and Ms. Irena Vojáčková-Sollorano, UN Resident Coordinator. Beginning her speech with a reminder that while the world was living through the best times of human history, global inequality hit historic highs; Ms. Ümit Boyner, President of the Executive Board of Business for Goals Platform, noted that the world was facing a range of problems from gender inequality to environment, from justice and climate change to poverty and hunger. Recalling that the Sustainable Development Goals aimed to solve the root causes of poverty and create a development model benefiting all “leaving no one behind”, the President of Business for Goals Platform Ms. Boyner stated that the Goals also offered significant opportunities for businesses.